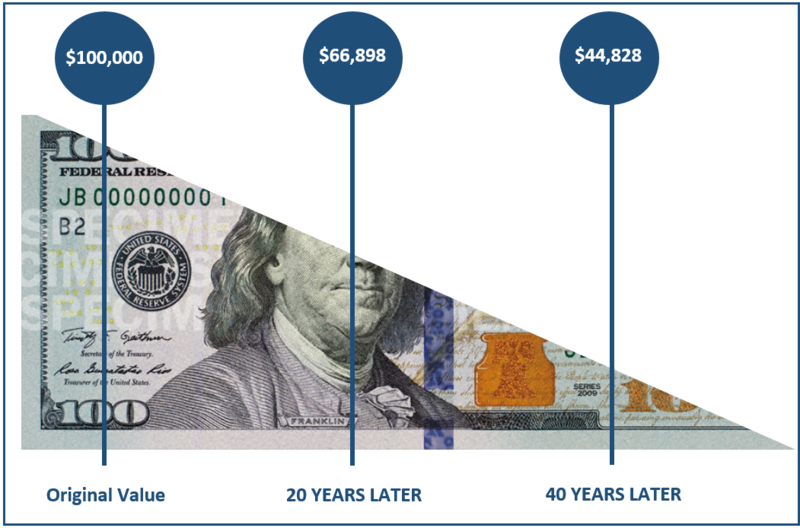 A modest 2% inflation can severely lower the value of your assets over the long-term. Higher equity exposure over longer market cycles has historically been an effective way to combat the risk of inflation. Internally, we envision a period of inflationary pressures north of 2% over the next decade. Full employment, coupled with expansionary fiscal policies, may fuel such an outcome. Source: 2% annual inflation is the Federal Reserve’s projected long-term inflation target. Merrill Lynch. Calculations are made using monthly equivalent figures of 2% (0.167%). The opinions voiced in this material are for general information only and are not intended to provide specific advice or recommendations for any individual. All information is historical and there is no guarantee of future results. This is a hypothetical example and is not representative of any specific situation. The economic forecasts set forth in may not develop as predicted. Stock investing involves risk including loss of principal.